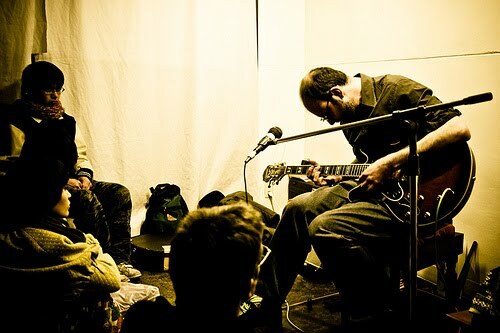 Anthony Guerra is Australian guitarists and one of the leading figures in their contemporary experimental music scene. Guerra has been invloved in experimental rock and folk music and free improvisation. In 2000 Guerra has lived in London where he was an active participant of younger scene of improvised music. Along with American guitarist Michael Rodgers he formed label Twothousandand, at that time a focal point of emerging scene of younger musicians in London (Seymour Wright, Ross Lambert, Joel Stern, Mattin, Takehiro Nishide, Paul Hood, …). With Michael Rodgers he formed Broken Hands duo and he had a duo with Joel Stern (releasing 2 records together) and with Matt Earle of Stasis Duo. He was also quite active in Australian and New Zealand’s experimental music scene, playing with Matt Nidek, Adam Sussmann, Mark Sandgrove Inge Olhmeim, Peter Blamey, Richard Francis, Antony Milton, Dean Roberts, Rosy Parlane, …. He lived and worked also in Japan. At that time he formed his own label Black Petal, focusing more on song format and releasing close to 40 releases.